Happy Monday! This illustration was on the Stern Blog back in November (I think), but it is too good to not share here. 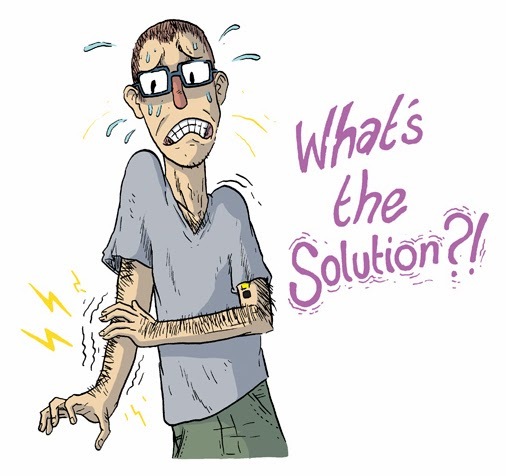 This comes from an old joke that Alec and I have about arm fatigue after playing pinball for too long. If ONLY there was some sort of solution to this problem! If ONLY there was a way to use on-the-fly geometry to level up your game to the nth lever!! 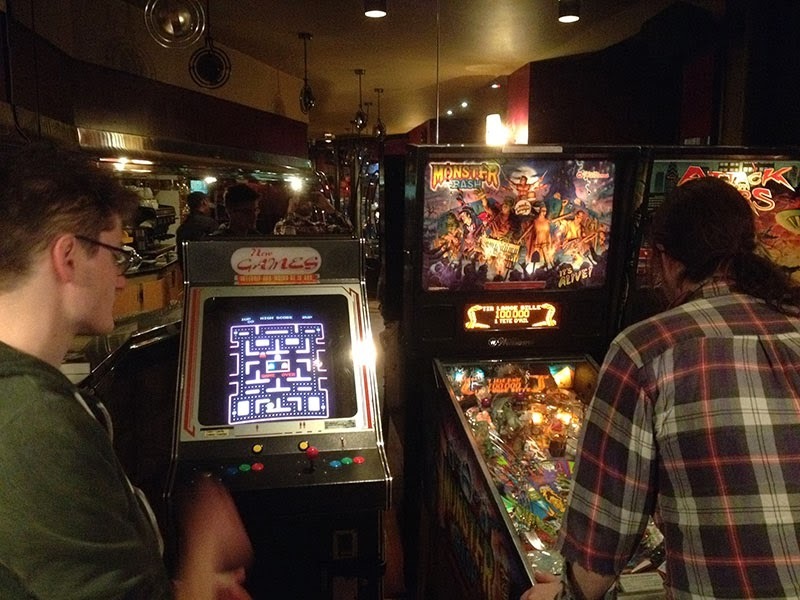 It was pretty funny, this young couple was cuddled up RIGHT next to the pinball machine (you can see a bit of them on the left in the photo below) and they jumped about a FOOT when I got a replay and the machine chirped. Max reminded me that last time I was in Belgium we found out about a guy that had a big private collection. I should have thought ahead and emailed him to see if we could have met up with him, but this was already a whirlwind trip, so I'm not sure we would have had time for it anyway. 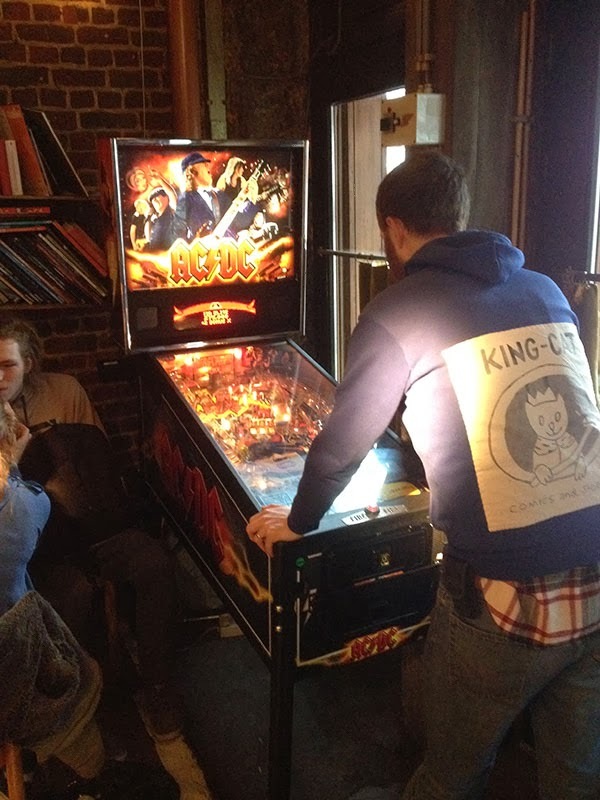 Oh well, I'm still glad I got to squeeze in a few games of pinball while I was overseas! I found this sketch in the old Jon Chad archives the other day. Truthfully, I can't remember for the life of me what it is from! It's not the right composition to make a good shirt, so it must have been a sketch for a poster? 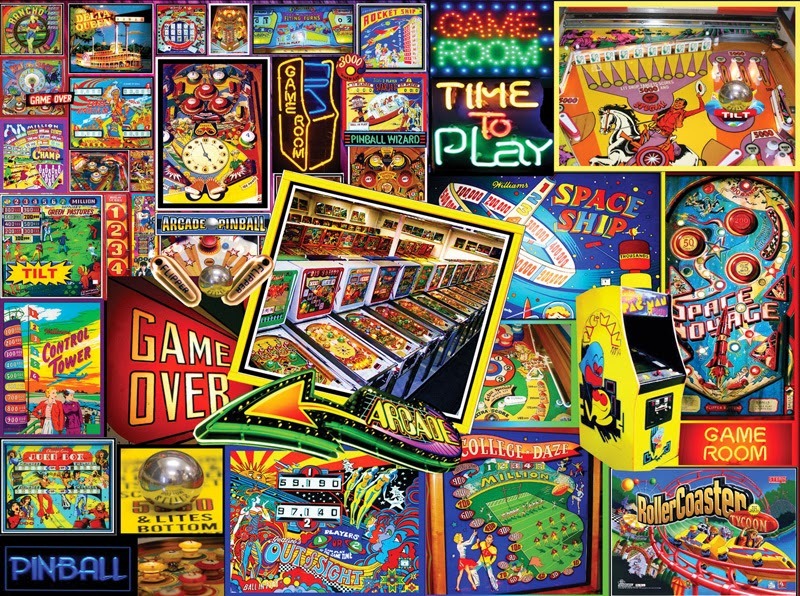 In any case, it's really fun, and illustrates one of my favorite things about pinball: the narrative behind the gameplay. I remember when Alec and I watched Tilt: The Battle to Save Pinball for the first time, and there is this bit about the game High Speed. They talk about how you are supposed to be the ball. That idea of what role you play in the game is interesting to me. 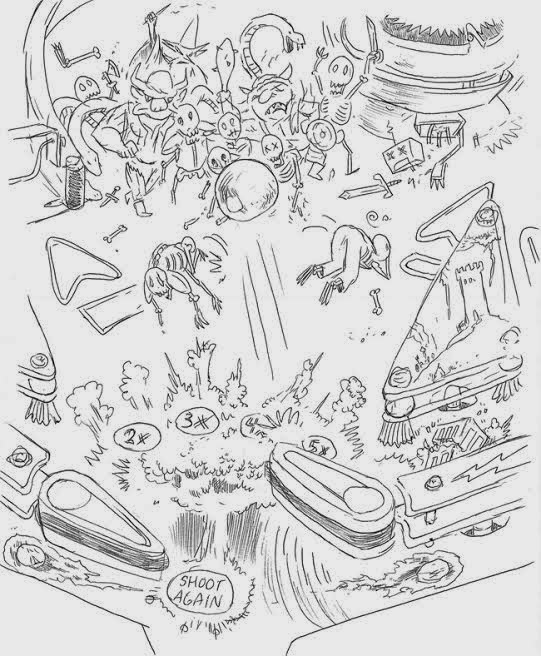 That's what I think I was trying to draw here; the battle between the player, and all of the modes, wizards and bosses you need to fight in pinball! 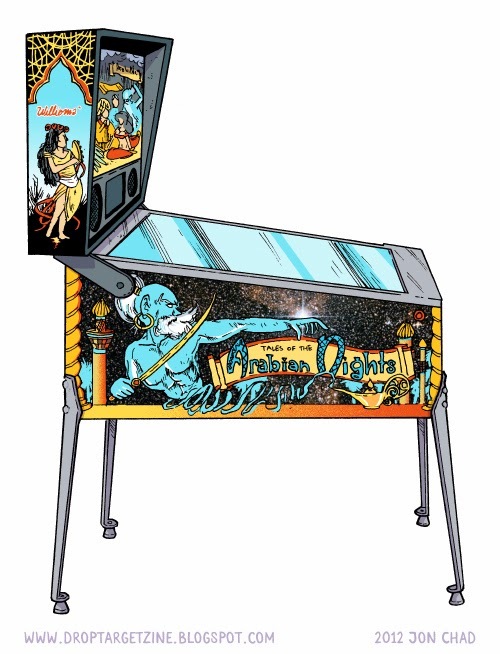 Here are some pinball illustrations of some of my favorite machines. 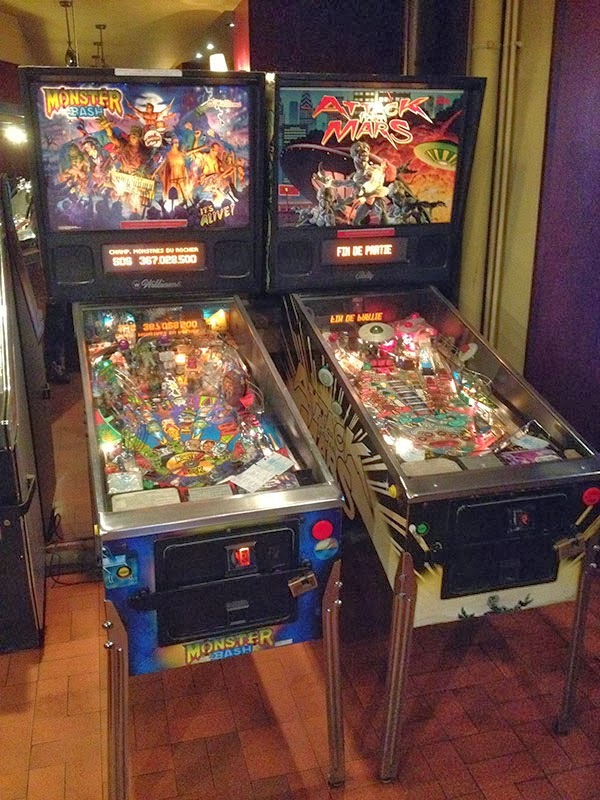 These originally appeared on the Stern Pinball blog. 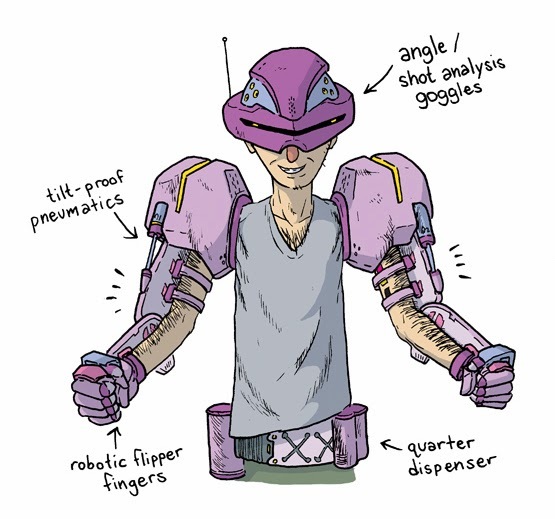 There's nothing really special or fantastical about the way that I've portrayed these machines. Really, I'm just practicing how to render forms and replicate illustrations. There is a lot of interesting airbrushing going on, especially on the TOTAN machine, and figuring out how to recreate that was an interesting challenge. I played one game on each. 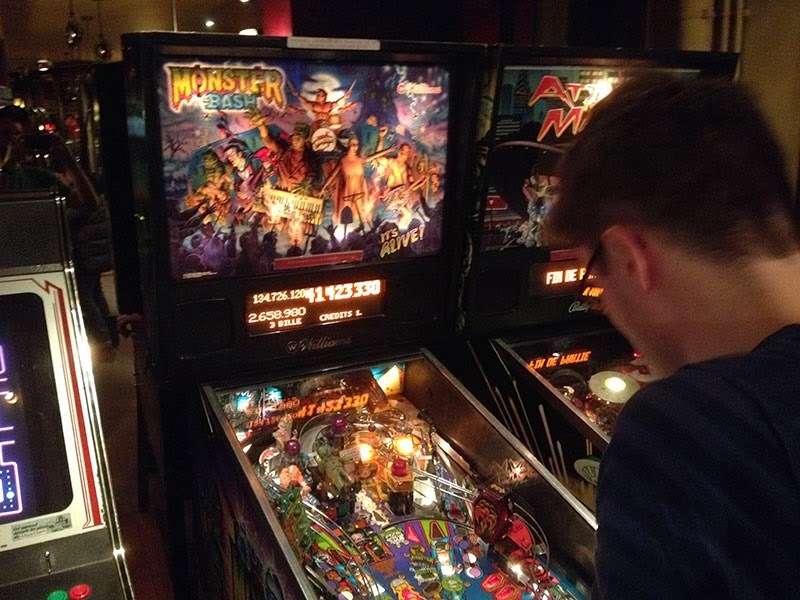 The flippers were super weak on ATM, like to the point where you couldn't get the ball over the left ramp, so we decided to focus our efforts on Monster Bash, which was in pretty good shape. 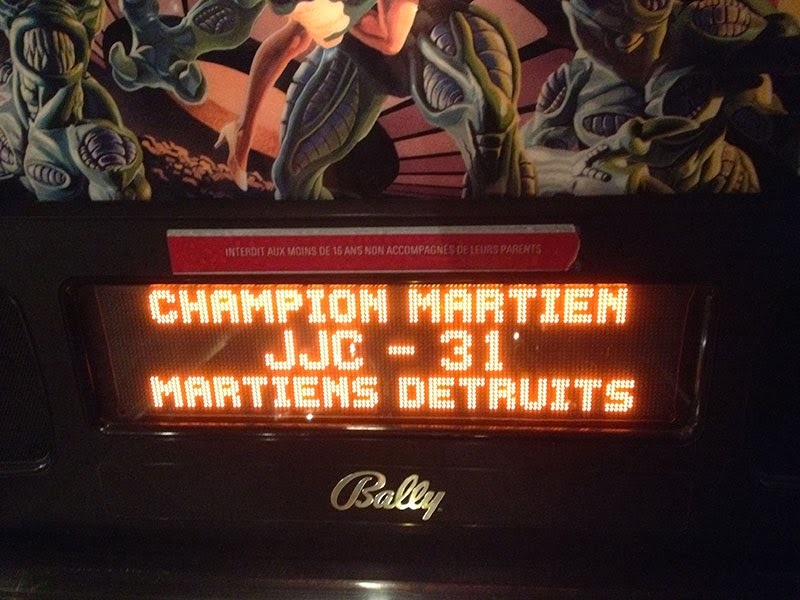 It's always kind of a trip playing a machine overseas and seeing all the French in the DMD and stuff. 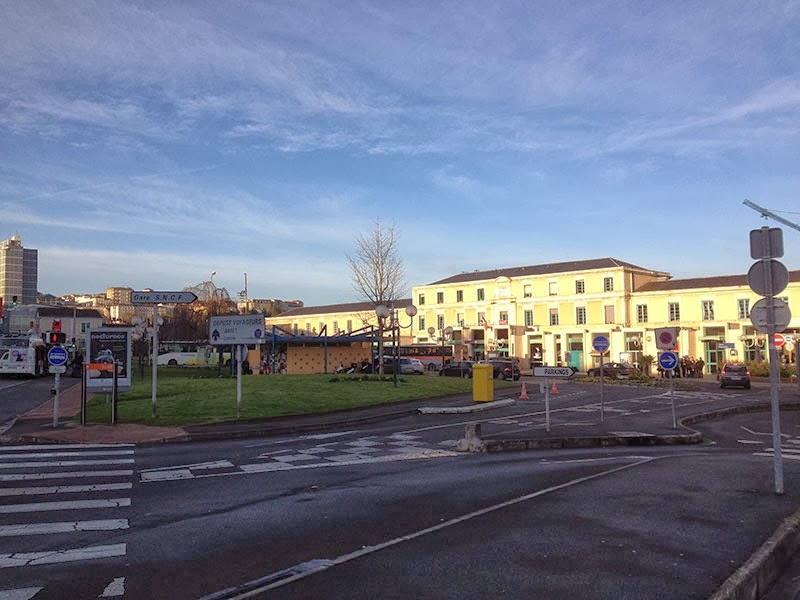 Both of these had a warning in red tape that said "Interdit aux moins de 16 ans non accompagnes de leurs parents" or "kids under 16 years must be accompanied by a parent" - REALLY??? 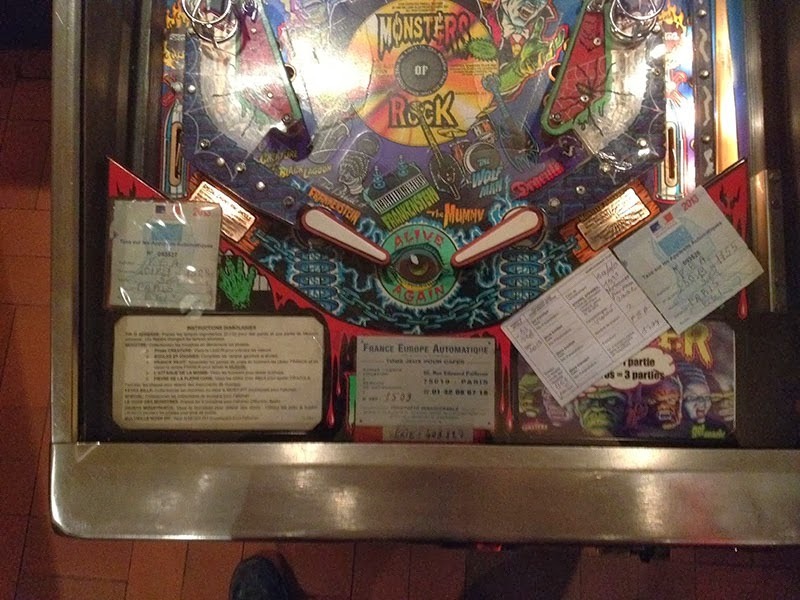 This was weird, I never saw this on any other machines... Maybe it's just a rule at that bar? It was also crazy seeing all of the different permits that were required to have this thing on location. Four different slips of official looking paper were crammed under the glass. Eventually my persistence paid off! 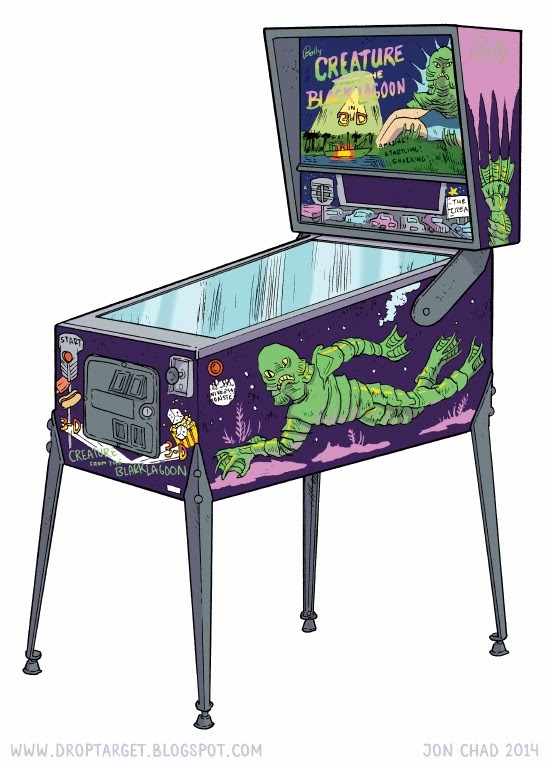 I was able to get a few monsters going and then started multiball and eventually made it to Monster Bash (though not with all the instruments). Anyway here you can see my 134M, which was enough to get a replay. I'm glad we didn't leave without showing this machine what-for! NEXT UP: Rocking out in Brussels! Man oh man, I REALLY liked this one! I can't tell you who it was for, since I don't think they're ready to let the cat out of the bag. As per usual, I drummed up several different ideas for a shirt design, and this one never got used. I think the composition is a little bit off to the right, but I love how the nerdy scientist is so confused, but the mountain of muscle to the right is 1000% on board. 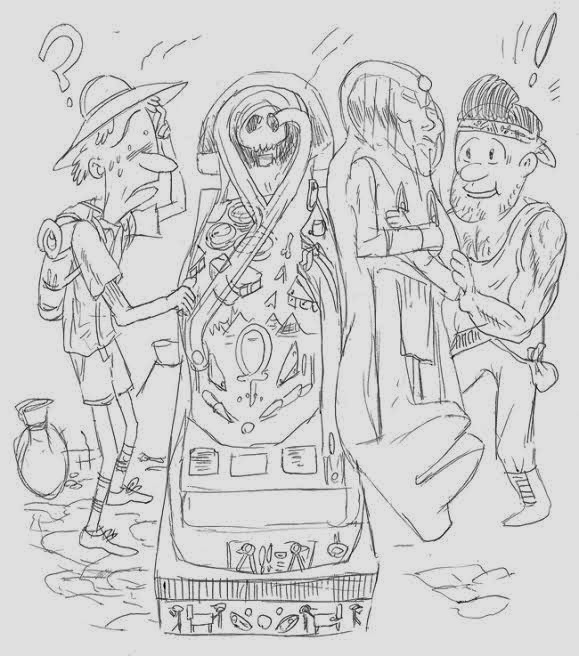 Truthfully, though, I like to think that the muscular guy was easily scared by ghosts and stuff, and wasn't into the idea of going through a tomb. Well happy day for him! There's pinball in this here tomb!! 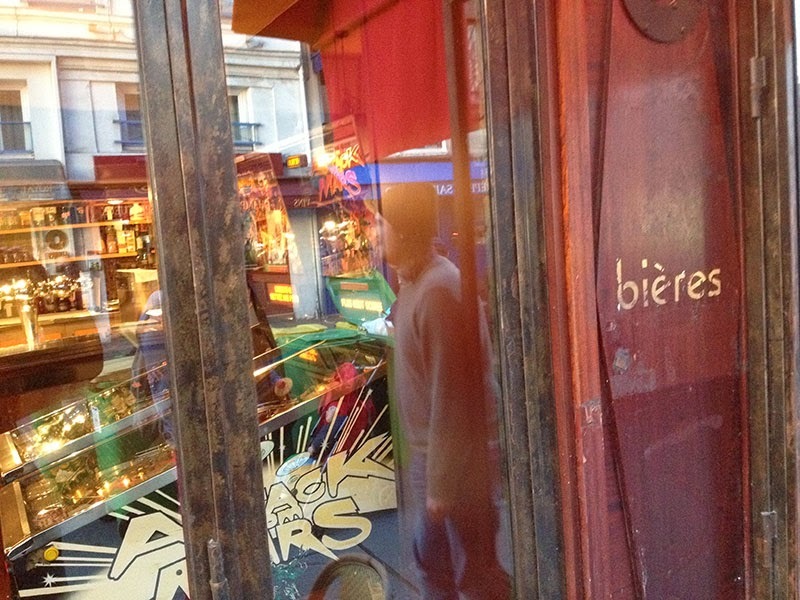 After signing books all weekend in Angoulême, we headed out of town on Monday. We packed up all our stuff and hiked down to the train station. Suddenly, my "pinball sense" was tingling! 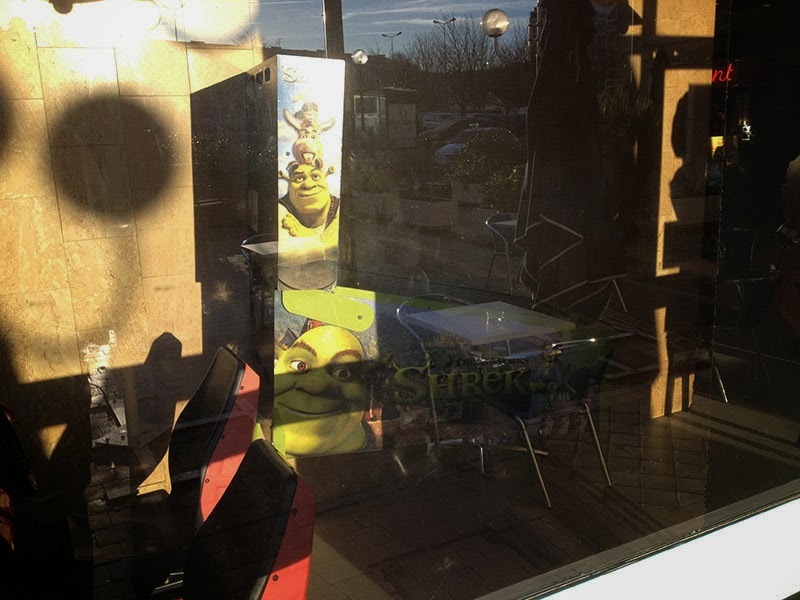 A Shrek machine in the window of the train station! HUZZAH! 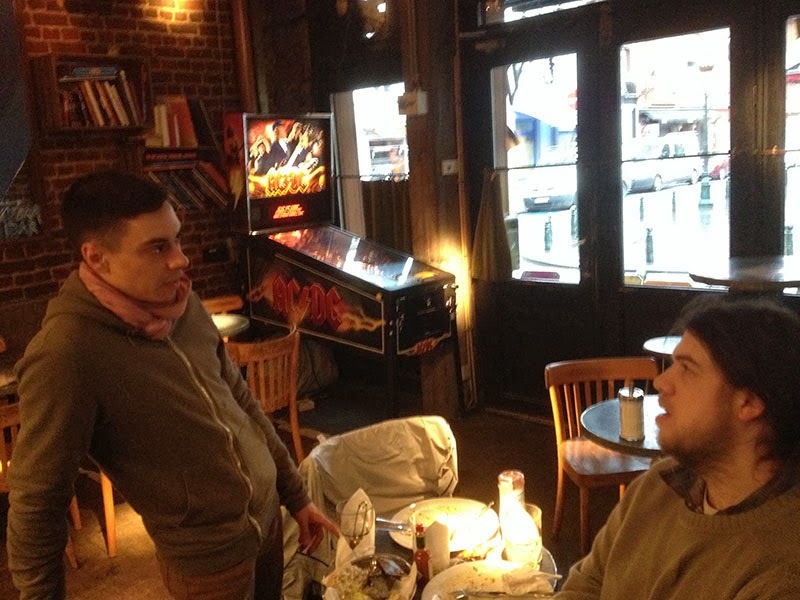 We had about 15 minutes before our train was scheduled to depart so all my friends hit the café to get some coffee and I plunked a Euro into the machine and started to play. On my first game I got a replay! Then on my second game I got another replay! When that game ended I got a match. 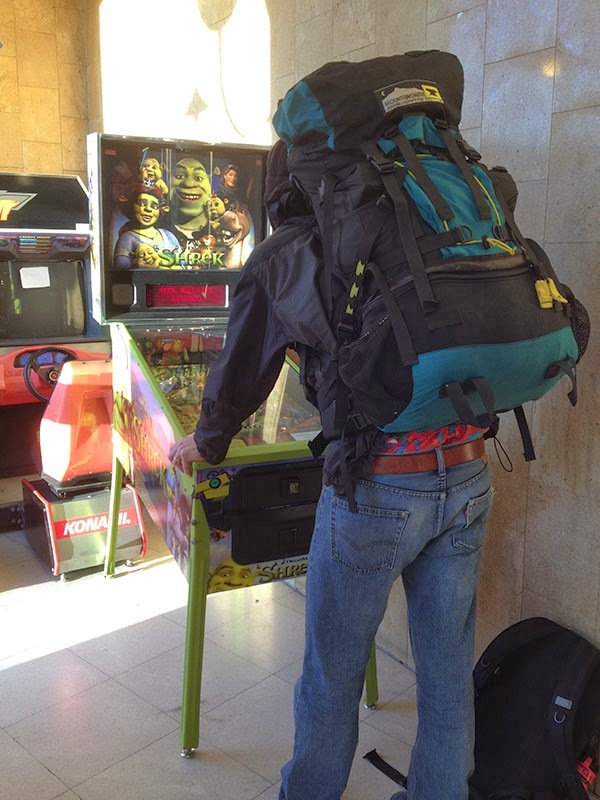 I had TWO credits on the machine, but we had to go catch our train. You're welcome, whoever played this game after me! NEXT UP: Flipper in the City of Light! Not a secret #2: I also love puzzles! Well, maybe that second one isn't as well known, but I have a soft spot for jigsaw puzzles. Leave an unsolved puzzle on my coffee table and I am POWERLESS to resist solving it. It's like Dracula and counting grains of rice. In any case, if and of you out there want to get me this jigsaw puzzle, you would be my new BBF!